Blueberry Cheese cake is quite different from other cakes in taste and look. It is very softy and delicious cake which give yummy taste in dessert time. 1. Combine cracker crumbs, butter and 2 tbsp sugar. Pat the mixture very well into the bottom of 9 inch spring form pan. 2. Mash the cream cheese until it will soft and creamy. Now add sour cream, vanilla extract, ¾ white sugar and flour into the mixture. Also beat eggs at a time. 3. Mi it very well. Pour the mixture in the crumb-line pan. 4. Bake it in 325 degree F oven for 1 hour or as required. 5. Cool it and remove the cake from the pan. 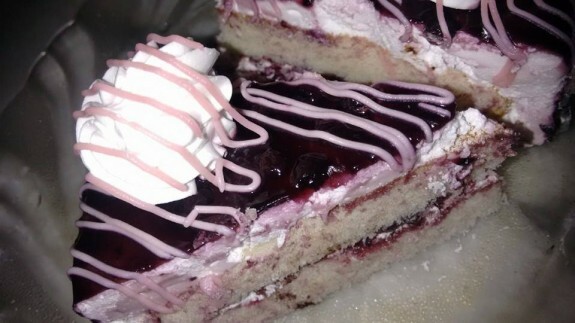 You can make layers of the cake by giving white cream and blueberry melted jelly in the middle of the 2 layer. 6. Now place white cream on the top. Then add blueberry melted jelly and frozen blueberries on top of the white cream. Give a scoop of white cream on it and make the blueberry and cream mixture design on the cake as per image to make the cake more attractive. Chill and serve.